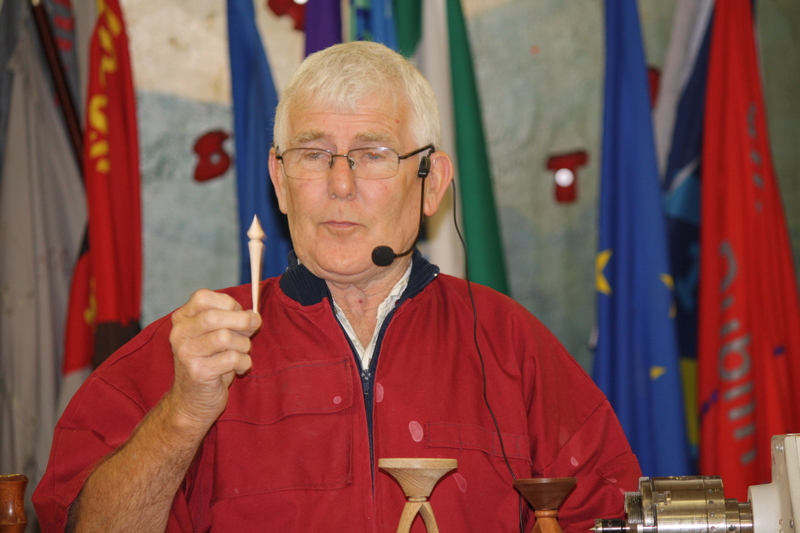 The chapter meeting for September had the services of Charlie Ryan as our demonstrator and Charlie as ever, gave us a very entertaining and enlightening demonstration of inside out turning. To begin, Charlie had a few words to say about safe working on the lathe, something we can all become complacent about and need reminding all the time. 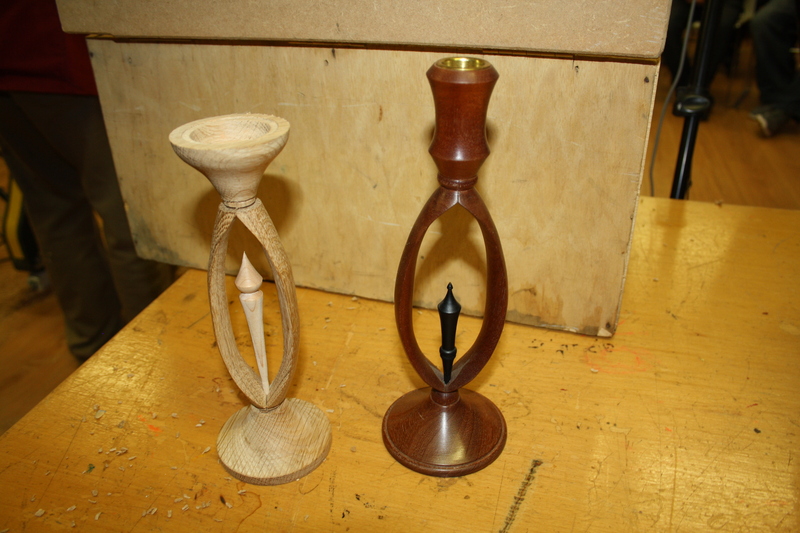 The piece Charlie showed us was a candle or tealight holder, made up of four separate sections, the stem, which is made up of two pieces 30mmx30mm and 200mm long, the base, which should be wide enough to give stability then the top holder. 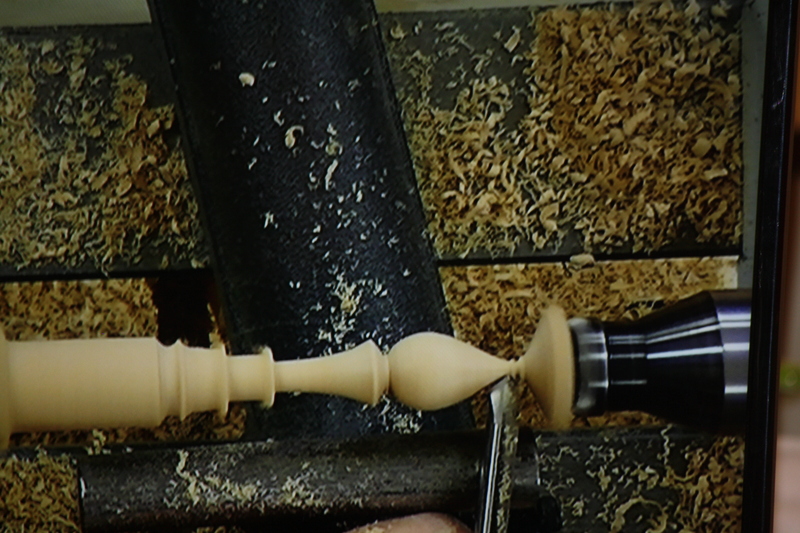 I am including two pictures of different designs to give an idea of general proportions; a finial is added as an extra artistic touch. 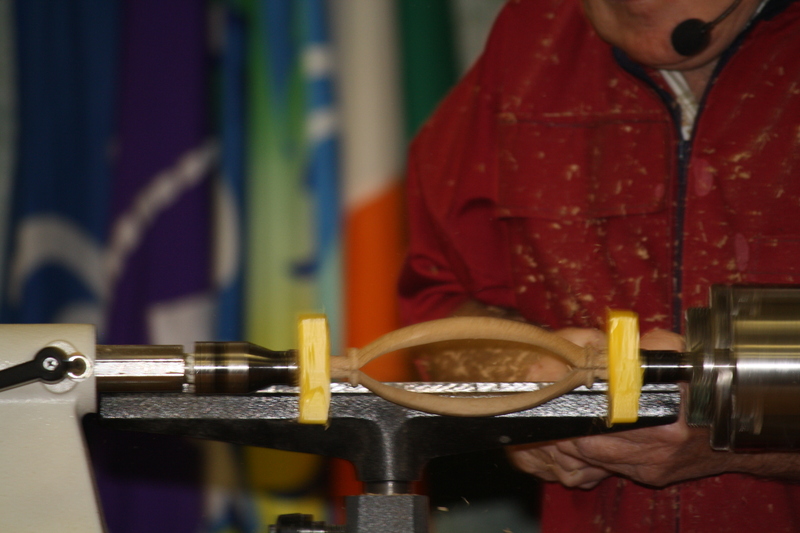 To prepare the stem for turning the two stem pieces are held together either by cable ties or a paper glued joint then mounted on the lathe between Steb centres, the teeth of course grip the wood preventing the point from splitting the joint. 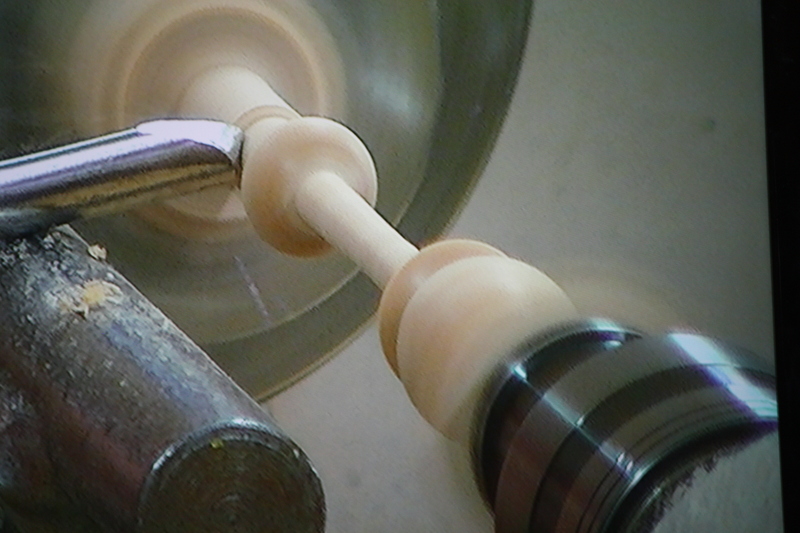 The piece is then marked out with a centre line and a top and bottomed line allowing for a bead and dowel each end. 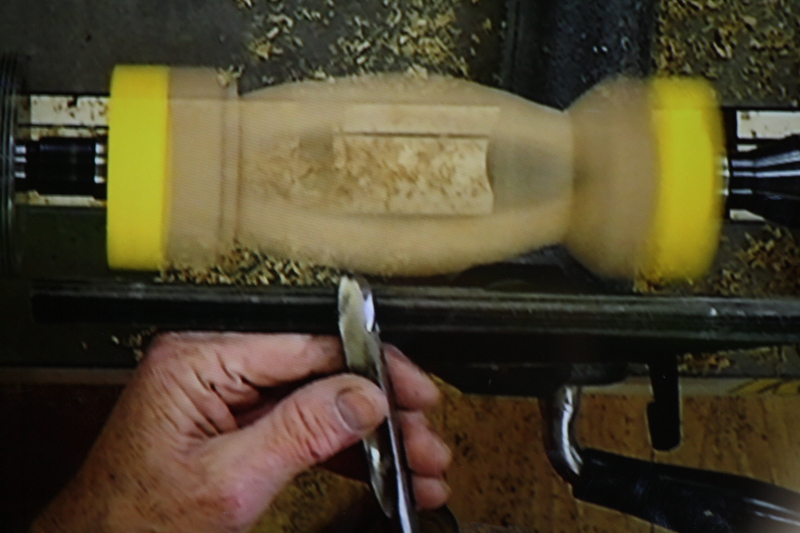 Working from the centre towards each end Charlie cut a downward curve to about 20mm from the joint finishing with a convex edge. The piece is now taken off the lathe and split or untied, then reversed and retied, (the cable ties are best for this, no waiting for glue to set} then back on the lathe. 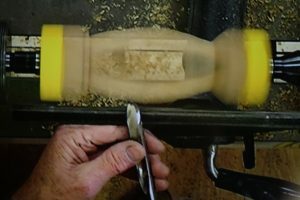 This time its an upward curve following the line already made and again finishing with a concave edge, the bead and dowel or spigot are then formed. 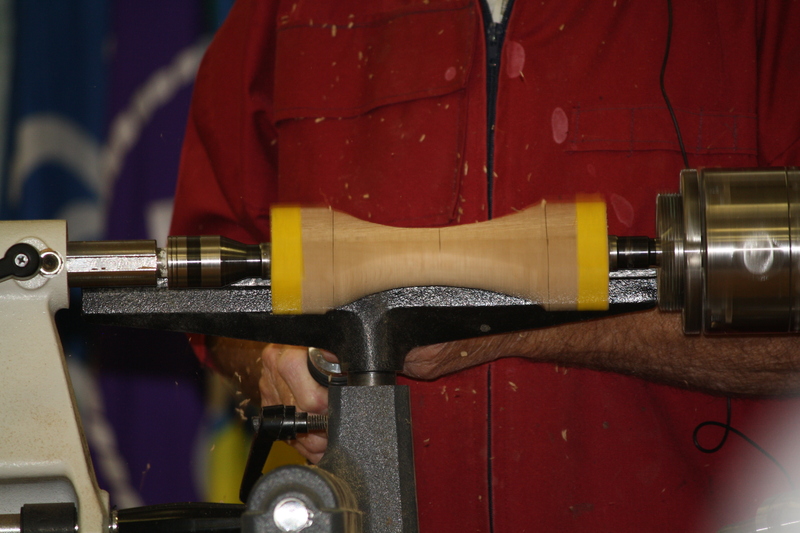 At this point a hole has to be drilled at the bottom to take the finial and there are several ways of doing this, one is to fit the piece in a chuck and drill the hole using a Jacobs chuck, use whatever equipment you have. 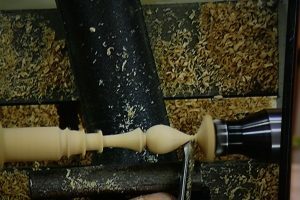 Lastly comes the finial which can be a delicate piece of turning, no bother to Charlie of course and with this done the whole thing is assembled, lovely job. 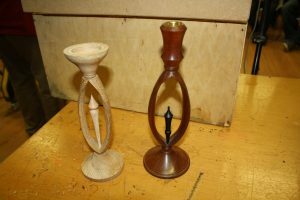 The design of the base, top holder and the finial are a test of your imagination so get to it, lets see what you have learned. Thank you, Charlie you give a good show, I’m know we will be seeing you again and wonder what piece of turned magic you will have for us. The monthly competition results are as follows. 1st Cecil Barron 2nd Joe O’ Neill and 3rd Pat Gannon. The novice section was won by Jim Cassin. 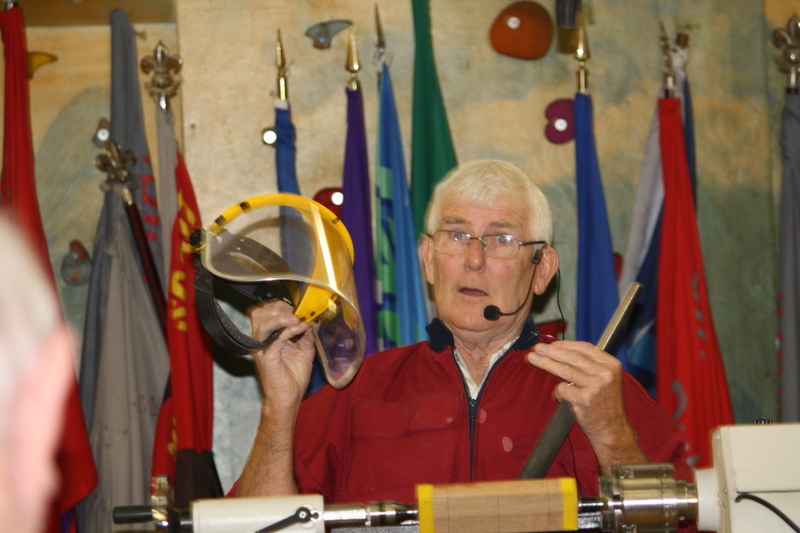 That’s all for this month looking forward to seeing you all in October, until then work safe.